Canada has become the dream destination for those looking for a better quality of life. Whether you are from a developing country like India or from a developed part of the world, Canada has an unmistakable appeal that is catching the fancy of immigrants everywhere. It offers high standards of living and career growth opportunities for almost everyone. Canada PR visa holders can also live and work in Canada and get similar benefits as available to their citizens. No wonder a lot of Indians are also applying for Canada Permanent Residency year after year. Quebec Skilled Worker Program (QSWP) etc. To make the most of these programs, it is important that you pay close attention to the documentation process. If a candidate commits even a small mistake or applies without the proper set of documents, it can lead to their application being rejected. One of the biggest errors that candidates make is while signing their application. They may miss some of the places where their signature needs to be put. For instance, in the case of Additional family application/form, a single page needs to be signed in 3 places. Many times, candidates can sign the bottom of the page and miss the other places where a signature is needed. Mistakes such as this can cost a candidate big time and lead to an application being returned or rejected. In such cases, the candidate will have to start the process from the beginning, causing unnecessary delay and monetary losses. You can apply for Canada PR Visa in several different ways and each program requires a different amount to be paid. The modes of payment are also different as per the immigration program that the candidate has applied under. Immigration offices around the world accept fees in the local currency from where the candidate is applying or residing, but it is also important for candidates to check and confirm the online exchange rate for the currency. They need to be extra careful when paying the fees. The Immigration, Refugees & Citizenship Canada (IRCC) has provided the dimensions in which a candidate needs to upload or submit their photo. They prescribe the instructions for a specific type of immigration application such as medical forms for PR applications etc. Submission of wrong size photographs can lead to a candidate’s application being returned. Most candidates submit only the documents mentioned on the IRCC checklist when applying for their Canada Visa. However, there may be times when a candidate needs to submit extra documents, apart from those mentioned by the IRCC. Depending on the case, a candidate needs to provide some additional documents to take their application forward. Failure to submit these can cause unnecessary delays in their visa application process. In certain cases, a candidate needs to provide some additional forms of information that is not mentioned in the initial immigration applicant forms. It is the responsibility of the candidate to ensure that all the necessary supplemental forms are submitted along with their application to avoid its rejection or return. The IRCC depends on the information a candidate provides while selecting the application for Canada PR. Submitting an application with improper or missing information can result in the whole application being rejected. Sometimes, providing the wrong information can also lead to exclusion from Canada for at least 2 years or more. If any application of the candidate is missing, it is essential that the candidate tells the IRCC the reason for the same and provide details as to when this information will be provided. Failing to do so can lead the application being returned or rejected. Many candidates prefer to fill the application by hand, even though all applications can be filled online with the help of Adobe Reader. Handwritten forms are never advisable as they cannot be verified. Forms that are created with Adobe Reader can be verified as they create a series of barcodes that can be easily recorded by IRCC in their system. Handwritten forms will take a lot of time to process as they require the transfer of information that can be tedious for the immigration offices, and lead to delays. A cover letter can establish who is applying for what and can help the immigration officer to process your application within a shorter time. It lists out the main reason why the applicant qualifies for immigration and can also lead to better success while applying for Canada PR. Candidates applying for Canada PR visa often wait for the criminal record check before submitting their application. This is not advisable as criminal record check is not required for candidates who are not applying for Temporary Resident Permit or Criminal Rehabilitation. Sometimes rules may change while a candidate is waiting too long for the application submission and they may no longer qualify for programs such as Federal Skilled Category etc. If you’re mailing your application for processing to an office suggested by IRCC, you must ensure to use registered mail or through a reliable courier service. This helps you track the application and have proof of it has arrived at the office. 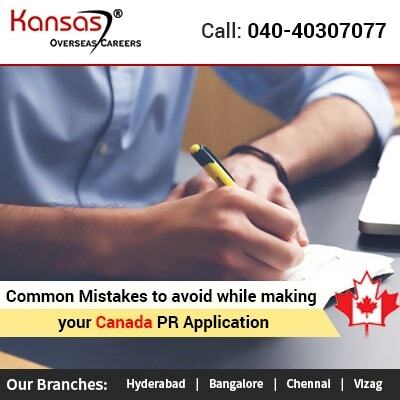 To avoid these mistakes and ensure a hassle-free process of applying for your Canada PR Visa. You can get in touch with Kansas Overseas Careers. Kansas Overseas is a visa and immigration consultant based India, with operation centers spread across India. They provide honest, competent and result oriented immigration services through effective consultation and visa processing. Kansas Overseas has the best ICCRC recognized Canada Immigration Experts who provide smooth and easy means of migration visa options to candidates. Get in touch with them on 1800-102-0109 to discuss more your Canada Visa application.